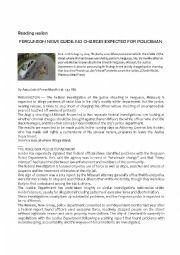 Complex reading activity about news report for advanced students, answer key included. 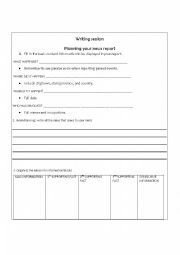 A writing worksheet to help advanced adult students prepare a news report based on a previous worksheet (reading news report), it includes a grid to brainstorm and organize ideas as well as space to make a draft. 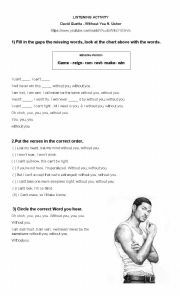 This listening activity has 3 exercises for students to review some modals such as can and will and some action verbs using a popular song by Usher. Teens will sure like it a lot. One of Glee�s most remembered covers is now availble for students to do different listening activities. 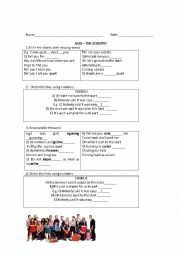 A grammar presentation about can/can�t with images and examples to be presented in the classroom during an English lesson. It can also be used a learning material by students. A short but useful presentation to be used in class for practice or review. Ss watch the first slides and then, take turns to describe the images.